It’s not an iMac, it’s a SolPad. Last month, Silicon Valley startup Sunculture Solar unveiled its solar-plus-storage solution, to Jobsian fanfare. SolPad™ was all over the tech media on the morning of September 22 (here, there, and seemingly everywhere). And while the iMac’s solar cousin hasn’t yet dented the universe, it seems that its effects were felt in Fremont. 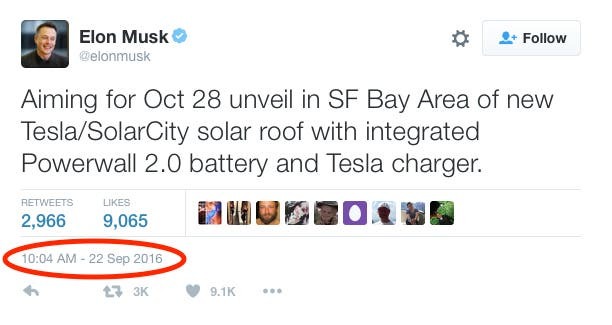 How else to explain Elon Musk tweeting at 10 am that same morning about the eventual unveiling of Tesla/Solarcity’s solar roof product? (He is known to be somewhat competitive, after all…) Or was that just one of the universe’s funny coincidences? 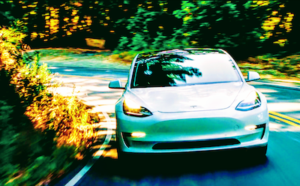 Owing to the comically belated nature of this article, most CleanTechnica readers have probably heard of the SolPad. 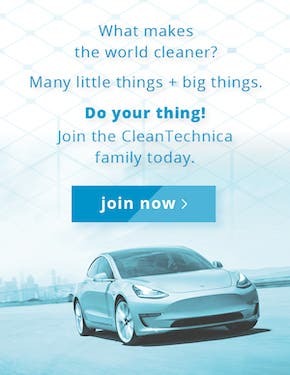 (And wondered why CleanTechnica hadn’t covered it yet!) A combination solar panel + storage battery + microgrid generator that can be plugged directly into an electric outlet, it looks to be the world’s first all-in-one, off-the-shelf plug-and-play solar solution. SolPads can also be daisy-chained together to create bigger systems offering more power and storage, as required. The company argues — compellingly — that by bringing balance-of-plant components into one product, SolPad can halve the overall cost of residential solar and storage by crushing “soft costs” such as design and labor. Despite photovoltaics, inverters, and batteries being mass-produced, residential solar + storage solutions remain expensive because they still involve a lot of “artisan” labor: engineers and installers design a system customized for each house and household’s needs, slap photovoltaics on the roof, sit the battery in the basement, and set up the necessary wiring. None of these tasks are easy to scale. The SolPad (and the clones it will inevitably inspire) stands to circumvent most of that by putting panel, inverter, and battery together in one manufactured enclosure, where mass production efficiencies can work their magic. 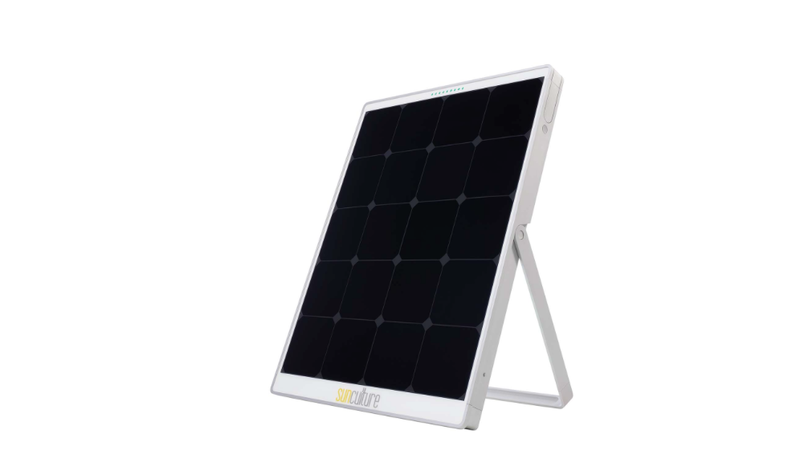 Eliminating the need for bespoke engineering and hired labour means the SolPad should be a cheaper overall solution, even if it doesn’t provide an optimal solar-to-storage ratio for most customers — even at modest production volumes. 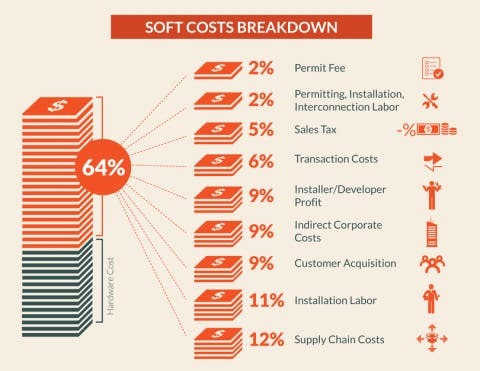 A US Department of Energy Office of Energy Efficiency and Renewable Energy study from earlier this year had soft costs being 64% (two-thirds!) 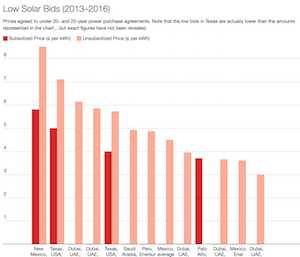 of the overall cost of a residential solar installation, which GTM Research estimated at $3.50 per watt. GTM also pegged the cost of fixed-tilt utility-scale solar, where the project size shrinks soft costs per watt to minimal levels at $1.33 per watt, or 62% (two-thirds!) lower. Using the numbers for residential solar systems as a guide, an all-in-one SolPad approach would minimize installation labour (11%) and installer/developer profit (9%). 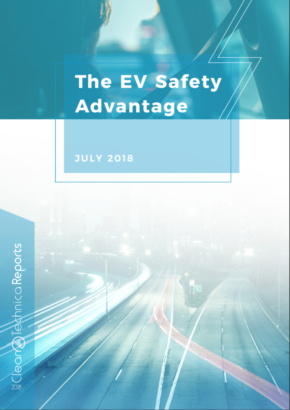 Assuming savings in supply chain costs (12%) and volume discounts from hardware suppliers, and the company’s claim to be able to halve the cost of residential solar + storage looks viable. 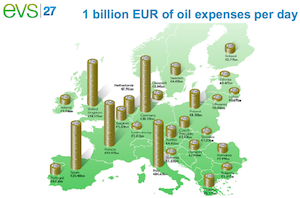 Best of all, if they succeed in collapsing the price of solar + storage products, the competition will follow, and we’ll all stand to benefit. Patent applications are generally more fruitful, since the US Patent and Trademark Office theoretically publishes patent applications 18 months after they’re first filed. In practice, they tend to be even quicker — a recent study showed half of US patent applications were published within 12 months of the applicant’s most recent revision. 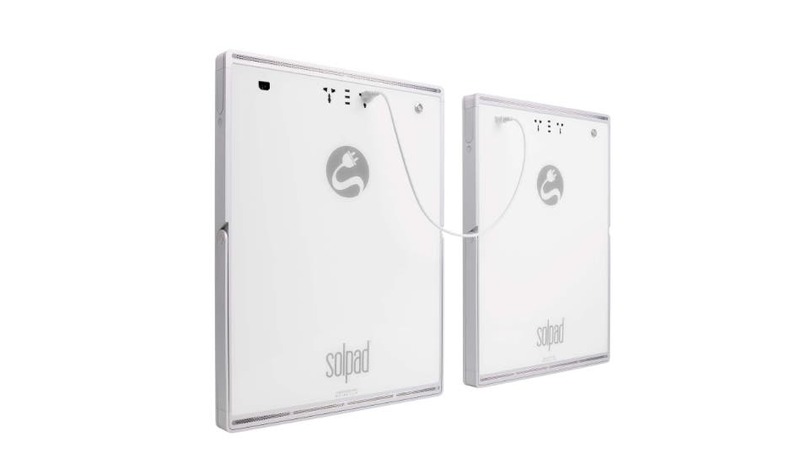 These corroborate the company vision for SolPad being a unibody product with behind-the-solar-panel storage (and ancillary systems), and a “flexgrid” inverter to keep everything running smoothly, even during power outages, which can incapacitate other solar systems. Some name changes might be in order though, as Civic Solar appears to have trademarked the term FLEXgrid. (Sunculture Solar also has to distinguish itself from similarly named and similarly promising startup SunCulture, which is using solar panels to pump water for irrigation for farmers in Kenya.) We’ll chalk those coincidences up to the “great minds think alike” phenomenon! SolPad — or a similar all-in-one solar/storage product architecture — looks poised to make big inroads to the residential solar market, though it might not dent the universe of the utility-scale solar market. As noted above, soft costs are far less important at the utility scale, and those purchasers are more likely to want exactly the solar/storage mix that would maximize their financial returns. 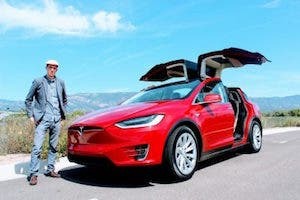 It will be interesting to learn what battery technology SolPad deploys — the company explained that it would use a “forthcoming solid-state battery technology” that is “inherently safer than standard lithium-ion batteries.” One presumes that products from Sakti3/Dyson and Johnson Battery Technologies have been in the running. While it’s pure speculation and almost certainly wrong, Sunculture’s claim that SolPad’s batteries will withstand punctures and 200°C doesn’t sound too different from JBT’s claims that its first-generation technology could handle 150°C. Of course, other companies are probably developing similarly robust battery technology, too. A product introduction in the second half of 2017 would give the forthcoming solid-state battery vendor an opportunity to scale production. A late-2017 timeframe would also give Sunculture Solar the opportunity to do deploy a test fleet over the winter. When asked if they had any highlights they wanted to share from prototype campaigns in the field, the company said these would be revealed in future announcements. It’s a fair strategy — startups generally seek to maximize publicity — but also suggests the first prototypes haven’t been deployed. Otherwise, the press materials would have probably included phrasing to the effect that X number of units were already harvesting Y hours of sunlight (or Z kWh of electricity) per week, month, or quarter. Perhaps readers who have access to up-to-date Google mapping imagery (or who live in Mountain View, California) can report whether an array of SolPads already graces the roof of Sunculture’s Mountain View headquarters! Irrespective of whether Sunculture Solar successfully leverages first-mover advantages to transform the residential solar space (à la iPhone), or whether “fast followers” ultimately outpace them (à la MacIntosh), one is left with the sense that the SolPad is a glimpse of the future — and one that we have an excellent chance of seeing play out!